If politics forces the closure of the Clinton Foundation, the flow of lifesaving HIV meds will abruptly end. In recent weeks, there has been a swirling debate as to whether the Clinton Foundation should continue its operations during and beyond the 2016 election cycle. Republican politicians, including presidential candidate Donald Trump, and mainstream media alike have called for the foundation's closure amid questions about whether donors gained special access to Hillary Clinton when she was secretary of State. Absent in the rhetoric surrounding this debate is the lifesaving work the foundation has championed to improve global access to affordable, modern health care — particularly in the fight against HIV and AIDS. Due to the lack of adequate recognition of the breadth and success of the Clinton Foundation’s many HIV and AIDS initiatives, we at Gay Men’s Health Crisis, the world’s first and leading AIDS service organization, felt it was time to speak up. GMHC is not a partisan or political organization. We have one singular mission — end the AIDS epidemic. To that end, GMHC has sought to raise public awareness of the epidemic’s continuing, harrowing impact and to press government officials to devote the resources needed to accomplish this goal. We both condemned President Reagan’s failure to address the HIV crisis and praised President Bush’s expansion of federal HIV treatment programs; we have criticized President Clinton’s HIV and AIDS strategy while in office and applauded President Obama’s policy response to the epidemic. GMHC has a long history of speaking up when we have felt that our elected officials and public figures are not doing enough, and an equally long history of praising our leaders, nonprofits, and other organizations when they introduce initiatives or plans that bring us closer to finding a cure. Thus it is crucial that we recognize the Clinton Foundation’s efforts toward eliminating HIV and AIDS around the world and acknowledge the dangers in discontinuing these initiatives. The Clinton Foundation has been battling the epidemic since 2002, when it made HIV and AIDS a focal point of the newly formed Clinton Health Access Initiative. At that time, only 200,000 people were receiving treatment for HIV and AIDS in low- and middle-income countries, with medications priced at over $10,000 per person each year. Since then, the Clinton Health Access Initiative has worked to reduce HIV transmissions and provide treatment in 70 countries across Africa, Asia, Europe, and South America. In 2015 alone, the Initiative provided extensive HIV testing and antiretroviral treatment to patients in Cameroon, Papua New Guinea, Vietnam, Ukraine and Monzambique, where they significantly reduced transmission rates. The initiative also coordinated fundraising and treatment programs in Uganda, Zimbabwe, South Africa, and Zambia. Due to the Clinton Foundation’s work, over 11.5 million people in the world now have access to HIV medication at 90 percent lower cost, amounting to more than half the adults and three-quarters of all children receiving treatment today. Put simply, the Clinton Foundation is helping to save the lives of millions of people living with HIV and AIDS. This is exactly the sort of effort that GMHC has been striving to generate from our nation’s leaders. And it is not something we can afford to lose, especially when we are closer to ending the epidemic than ever before. Over the years, GMHC has fought to organize and direct the energy needed to defeat the epidemic. The Clinton Foundation has played a key role in delivering the knowledge, testing, and medication needed to reduce the transmission rates of HIV and to provide care to those who would otherwise fail to receive it. In so doing, the Clinton Foundation is far more than a charity — it is the boots on the ground in the global war against AIDS. Its focus on developing global health policies has helped to not only provide screening and treatment to regions overwhelmed with HIV patients but also to institute long-lasting, sustainable change that has consistently shown results. President Clinton, Secretary Clinton, and Chelsea Clinton have used their influence to provide a voice to the voiceless — to create hope for the hopeless in regions of the world that have long suffered in the shadows of inflated pharmaceutical prices and fractured health care systems. Before the 2016 primaries began, GMHC circulated a questionnaire to all the presidential candidates asking how they each plan to manage one of the worst epidemics on the planet. The purpose of the survey was not to endorse a candidate but rather to hear each candidate’s policies regardless of their political party on ending HIV and AIDS and give each of them equal opportunity to communicate these positions to the public. It is telling that only three out of the 18 candidates running for president at the time answered — former Maryland Gov. Martin O’Malley, Vermont Sen. Bernie Sanders, and Secretary Clinton. 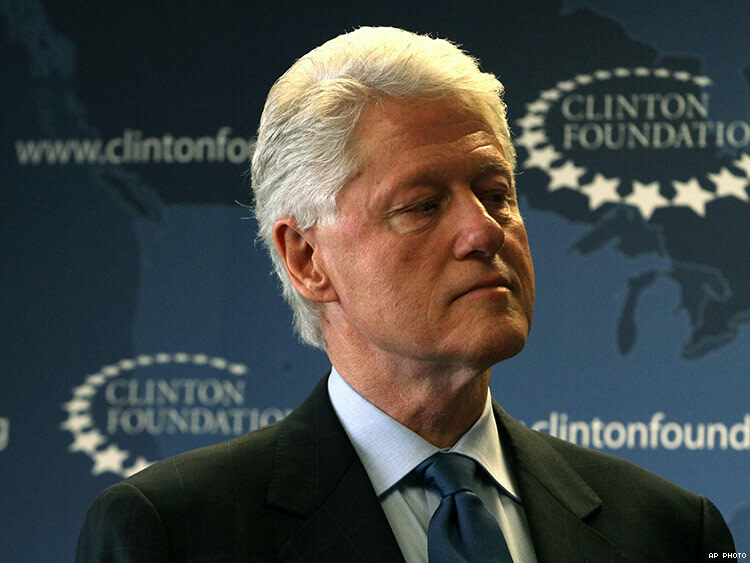 GMHC has worked to ensure that the HIV crisis does not disappear from the public’s eyes; in turn, the Clinton Foundation has long taken notice and acted accordingly. It would be a tragic shame if political circumstances forced those suffering around the world to once again fight for their lives without a more powerful voice to echo their own. GMHC wants leaders around the world to know that as the first in the fight that started over 35 years ago, we need more organizations like the Clinton Foundation, not fewer. KELSEY LOUIE is the CEO of the Gay Men's Health Crisis. Follow him on Twitter @KelseyLouieGMHC.